Keep Your Organization Abreast of New Technology to Meet Technical Challenges. Planning ahead to keep your organization remaining at the forefront of the latest technology while maintaining a manageable and agile IT infrastructure seems to be a big challenge to many organizations. The right IT plan not only helps reduce your operational costs, improves your customer service but also speeds your time to market and lowers your investment cost. Instead of hiring your own CIOs which normally exceeds your budget, why not take advantages of the knowledge and experiences from our team of experts? Collaborative Working: We work with you to discover how your IT system currently interact with your business processes and give appropriate suggestion to make it more convenient and easier for your staff to collaborate and communicate with each others and with your clients and partners. Network Connectivity: Whether it’s the connection from your head office to its branches or from your workplace to outside, we make proper assessment of your current needs and infrastructure and help you fill the gap or come up with new solution ensuring that you have the right connectivity to do your jobs – even when you are on a mobile device. Remote Access Ability: Working out of office increases your productivity and creativity, yet security issues can arise when you remotely access to company data. That’s where we come in to help you analyze and choose the best remote access control and solution to meet your specific needs. 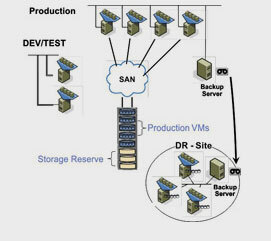 Database Backup: Your business needs a large amount of data to run and generate profits everyday. Database capacity and backup can be your headache if you don’t know how to properly handle it. We together with years of experiences in database solutions supporting a wide range of clients successfully backing up and restoring their valuable database in the event of a power outage will help you do the same. Security Policy: Your system needs to be safe and secure from any internal or external attacks, viruses and hacking. As a matter of fact, it’s crucial for your business’ survival to have a well-defined security policy in place. Fortunately, we have proof-of-concept solutions to help you with the security policy that can be tailored to your specific needs.